Your wedding day is one of the most important days of your life. Let us help make your dreams come true with our spacious reception hall. 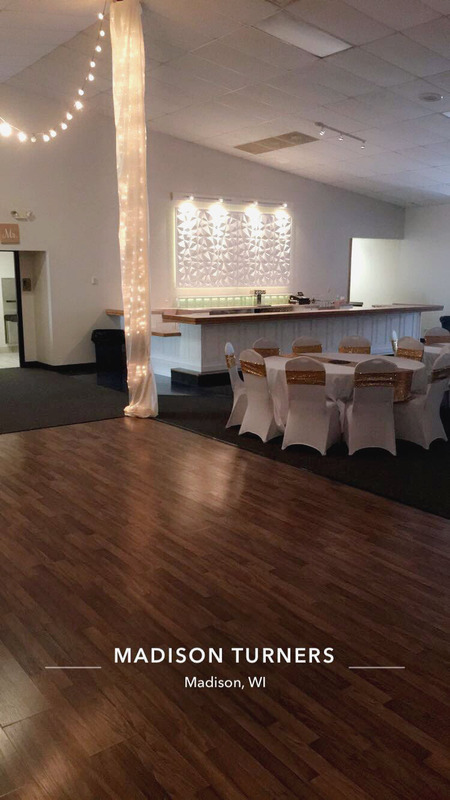 We provide more flexibility than anyone else when it comes to your wedding – you won’t find more options with decorating, catering, or beverage packages than we offer. From small and intimate to large and magnificent, our banquet hall can accommodate parties of up to 400 people. All of this comes at one of the best values in town as we work with you to create your perfect vision. 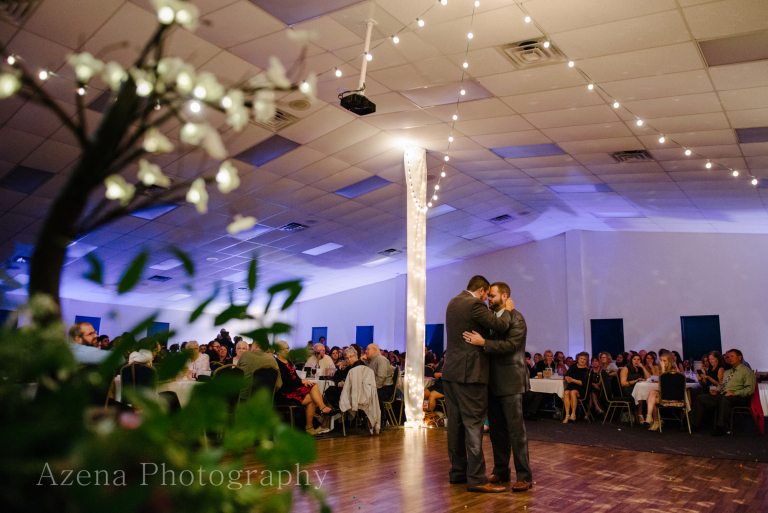 There are many options for choosing a reception hall, so what makes us different? 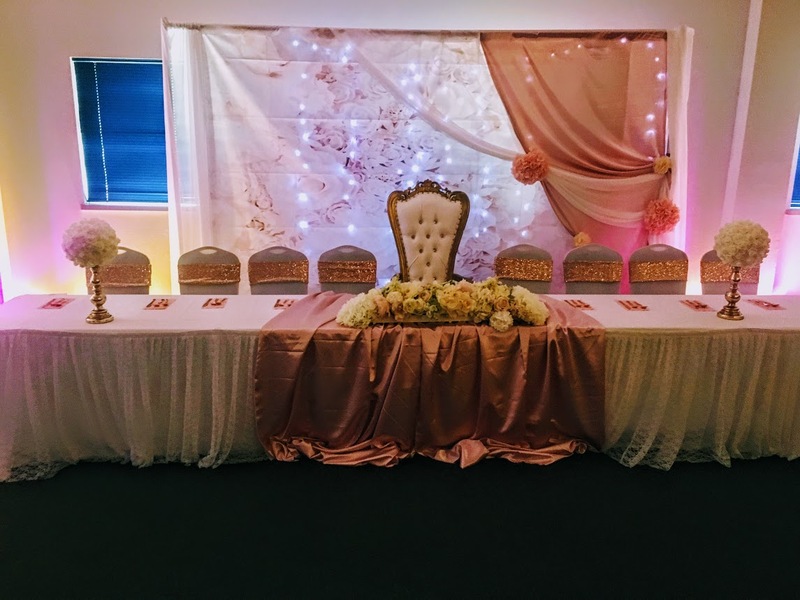 Wedding Team: We work with you to give you the wedding you’ve always dreamed of – we want each wedding reception to be unique and not a cookie-cutter. Decorations: We give you the ability to choose how you want to setup. You can do everything yourself or rent a décor package from us. Room Setup: The room can be arranged to best suit your event, using our suggested layout guides, your imagination, or a combination of both. Catering: We work with nine of the area’s best caterers to provide you cuisine that suits your tastes. 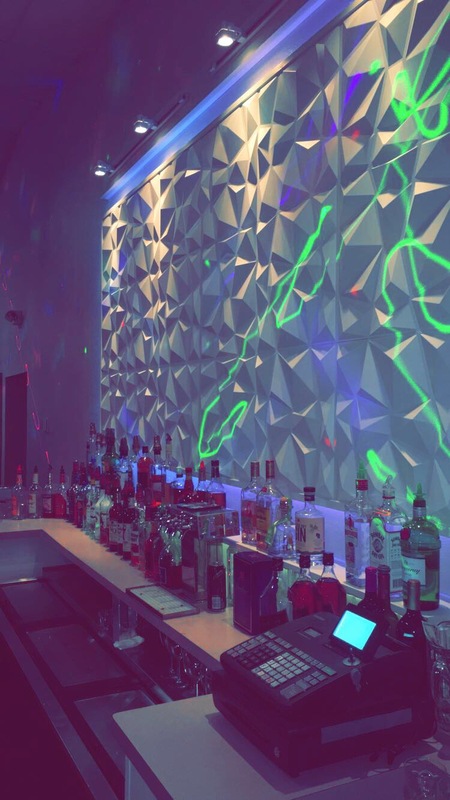 Beverages and Bar: We offer a variety of beverage packages and work to customize for each reception. Our gorgeous oak bar provides an extensive counter and ample space for guests to enjoy their drinks. Kid-Friendly: Unique to weddings with Madison Turners is our kid-friendly gymnastics hour where kids can play, supervised, in our gymnastics area. Accommodations: There are over five hotels within a three mile radius, and dozens within the area. We could not have been happier with Turner Hall as our venue!! They were so accommodating and helpful with every request we made. I love Turner Hall because they have worked with so many vendors, so I didn’t have to go between them and my DJ, caterer, linen company, etc. Our event planner, Katie, did an absolutely amazing job!! She knew every question to ask, and reminded me of so many things. She made the wedding process immensely easier, and for that I am so grateful! 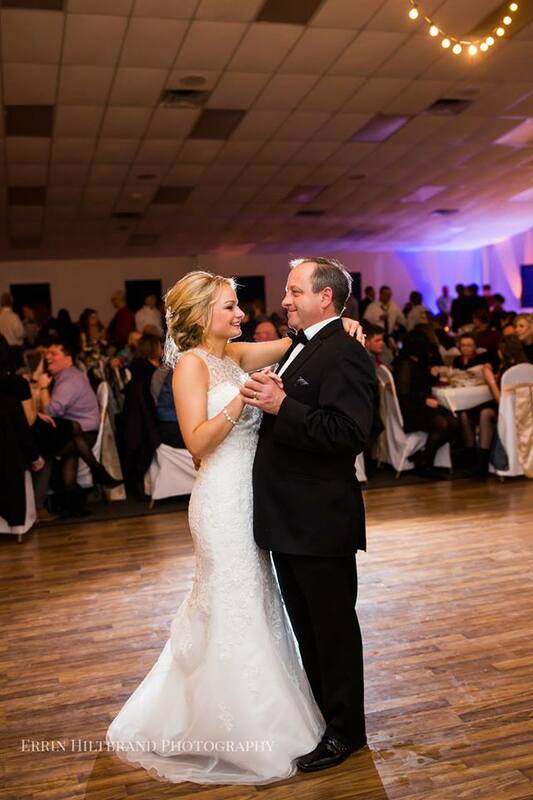 My husband and I would recommend Turner Hall to anyone who needs a great venue and event planner! Feel free to contact us if you have specific questions about our services. Tables and chairs: We have a combination of various-sized round tables and rectangular banquet tables. Overall, we have enough tables and chairs to seat 350 people. Linens: We provide rental options for linens. If linens are rented from us, ordering, setup and teardown are included in the rental fee. 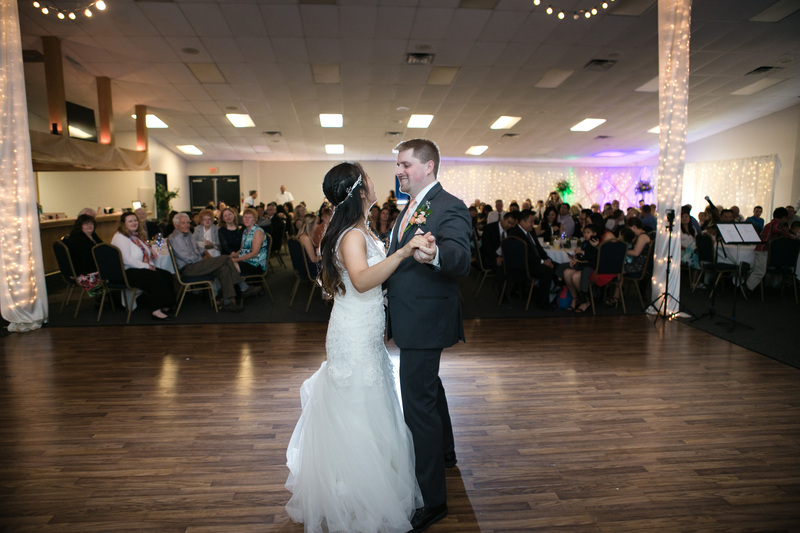 Dance floor: We have a beautiful, 625 square feet hardwood dance floor. Sound system: We have a sound system available that includes a wireless microphone, lapel microphone, CD player, 1/8” headphone jack input (for computers, cell phones, or tablets), and speakers throughout the hall. Projector: We have a High-Definition overhead projector for use with a single HDMI connection. Head Table: We setup the head table unique to the needs of each wedding. Cake table: We include a cake table, and we work with you to determine what size table works best. Cocktail tables: We have a limited number of cocktail tables available for use. We work with nine local caterers to give you a variety of menu and budget options. For more information about each caterer, see the information below. Q: How many other weddings are scheduled that day? A: We only have one banquet Hall, so you will be the only event in the building. Q: How long will I have use of the event space? Q: I reserve? Is there an overtime fee if I stay longer? Q: Can I hold my ceremony here, too? If so, is there an additional charge? A: Depending on how much of a room change we will have to make from ceremony to reception. This all depends on guest to attend, and room style preference of the renter. Q: Is there a bride’s changing area? A: We have an additional room that is adjacent to the hall that can be rented and used if the renter prefers. Q: How much time is allocated for the rehearsal? Q: Are there adequate bathroom facilities? A: There is bathroom with great accessibility close to the entrance & bar area. Women’s has handicapped stall, and additional 5 stalls with 3 sinks, baby changing table. Men’s is 4 urinals, and 2 stalls. A: Yes we are one level, with 4 handicap parking and great access to the entrance. A: We have over 150 parking spots available. Overnight is acceptable. With many surrounding hotels that offer shuttle service, you can be at ease knowing your guest will be safe after the reception. Q: What is the venue fee and what is included in that price? A: It does depend on the date and season for pricing. Please see the most recent wedding packet. Included in the rental: tables, chairs, set up and breakdown, up lighting, dance floor lighting, AV/Sounds equipment. Q: How much is the deposit, when is it due, and is it refundable? A: To book the date we ask for $500.00 security deposit, which is refunded 2 weeks after the event, giving that there is no property damage. A: If there is a cancellation within the 6 months before the event date, the security deposit will forfeit as liquid damage. We will make every effort to re-book the hall; however, if it is not re-booked, you forfeit all monies paid. If a cancellation is successfully re-rented, all of the rent, taxes and damage/security deposit will be refunded, less a $100 cancellation fee. Q: What’s the payment plan for the entire bill? A: Security deposit is due when booking the date. Then when we meet to go over final details (about one- and half months out.) that are when rental payment is due. The beverage and linens are depending on the guest to attend so those will be due week before. Q: Who is responsible for setting up and tearing down the decor, and when will it be completed? A: We will have all the tables and chairs set up to the diagram that you choose. The items of décor that you put up and brought will be something the renter will be responsible for. If there are items unwanted we can discard them for you. Q: Does the venue have liability insurance? A: Yes, we are fully insured. If any incidents or injuries occur on premises, a report must be filled out. Q: Will there be security guards on site, or do I need to make my own arrangements? A: We don’t typically have guards, but if wanted they will have to be arranged by the renter. Q: Must I use in-house caterers, or choose from a preferred vendor list? A: We have a preferred caterers list that you can choose from; if there is someone outside our caterers list it will have to be approved by Madison Turners. All caterers are subject to a caterer surr- charge typically 10-15%. Q: When can my vendors arrive for setup? A: Usually about 1-2 hours before the reception. If it is décor vendor, then we will try and accommodate day before or the early morning out of the rental hours. Q: Are there any decoration limitations? A: Yes, as long as they have a protective bottom if they’re on tables. Q: Are tables, linens, chairs, plates, silverware and glassware provided? If so, is there an additional charge? A: Tables we have in house are provided. We have 4 styles of tables to provide for your wedding. We have 2 size rounds that seat 8 people, and 10 people. We have a rectangular banquet table that seat up to 8 people. We have 3 cocktail tables. Linens we have to rent for $6.00 and skirting at $2/ ft. We also have some décor options for rent. If you rent linens, or décor we have to offer we will place the order, set up and take down. A final guest count is required 7 days prior to date event. Q: Can I move things around and decorate to suit my purposes, or must I leave everything as is? Q: Does the venue own sound equipment? A: We have AV, Projector, and Sound System in the banquet hall. The sound system is not made for any kind of live music.